An obelisk commemorates the climbing of Mount Abrupt by Thomas Mitchell on 14 September 1836, with a plaque added in 1986 to celebrate the 150th anniversary. The memorial was intended to be unveiled on the 14th September 1914 to coincide with the 78th Anniversary but the war and the State election caused a postponement. Thirty-six cairns or tablets to Mitchell were erected at Nyah West, Swan Hill, Cohuna, Mount Pyramid, Fernihurst, Wedderburn, Kanya, Stawell, Mount William, Horsham, Mount Arapiles, Miga Lake, Harrow, Coleraine, Casterton, Dartmoor, Isle of Bags, Portland, Mount Rouse, Mount Napier, Hamilton, Lake Repose, Dunkeld, Middle Creek, Mount Greenock, Skipton, Mitchellstown, Nagambie, Castlemaine, Expedition Pass, Kyneton, Benalla, Wangaratta, Chiltern, Gooramadda and a public park at Natimuk (Major Mitchell Park, Mount Arapiles, Natimuk. Who having discovered Mt Abrupt ascended it 14th Sept 1836. 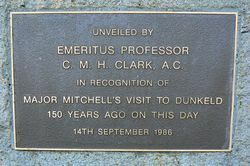 Unveiled by Emeritus Professor C. M. H. Clark, A.C.